At about the time I began my recent lace obsession, and pre my trying to actually use excel instead of simply knowing it lived in my computer, a friend was trying to work on a lace repeat that was found online as part of Staceyjoy’s knitting stitch portfolio, now part of the site. 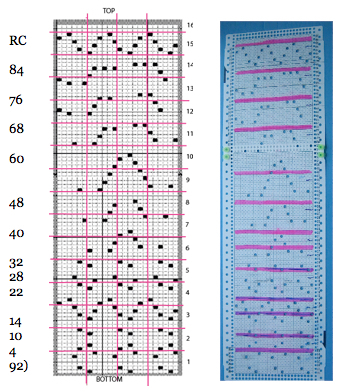 As a result, the downloadable pdf below bears the name it does, includes my how/to suggestions for the journey from electronic single repeat to punchcard, and the resulting swatch. One additional tip: when working with copies it is good to mark tops and bottoms clearly, especially if combining pieces of patterns so as to avoid marking/punching and vertical mirroring mistakes. There are several brand KMs still around and in use, most are no longer being manufactured. Questions often come up on using one KM brand pattern card on another. Card readers inside the machine are below eye level, so exterior number/other markings on cards or mylars reflect that, providing the knitter with a visual cue as to where they “are” in the repeat. If machines pre select, the needle selection may not bear any relationship to actual design row on the punched card or mylar as opposed to what one “sees”. In addition to this variable in lace one often has 2 carriages in use. It is possible to develop cards etc. 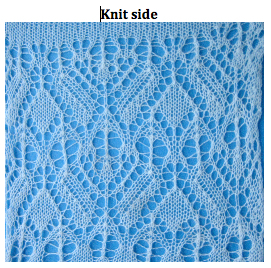 from lace hand knitting graphs, but there is enough “going on” so a good place where to start experimenting is with pre drawn ones. Lace preselection on any single row may have no obvious relationship to where the lace hole will ultimately end up. Both Brother and Studio published punchcard volumes, now out of print.